In 2010, European households consumed almost 13 percent more energy than two decades ago and generated 25 percent of energy-related greenhouse gas emissions. This is a trend that must be reversed if the EU is to reach its goal of reducing primary energy consumption by 20 percent by 2020. 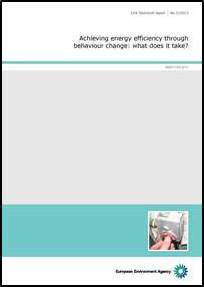 In its report ‘Achieving energy efficiency through behaviour change: what does it take?’ prepared jointly with Ricardo-AEA, the EEA investigates what it takes to achieve energy savings through changing consumer behaviour. “The successful implementation of energy efficiency policies, usually involving technological interventions such as Smart Meters, will also require changes in consumer behaviour and energy consumption practices,” said Ricardo-AEA project manager Jonathan Perks. Copies of the report can be downloaded from the Ricardo and EEA websites and the online survey launched by EEA linked to the report can be accessed at: http://www.eea.europa.eu/about-us/what/public-events/surveys/energy-consumption-in-households. The EEA survey will be open until May 17 2013. A full copy of this press release together with the report ‘Achieving energy efficiency through behaviour change' is available from the links at the top right of this page.